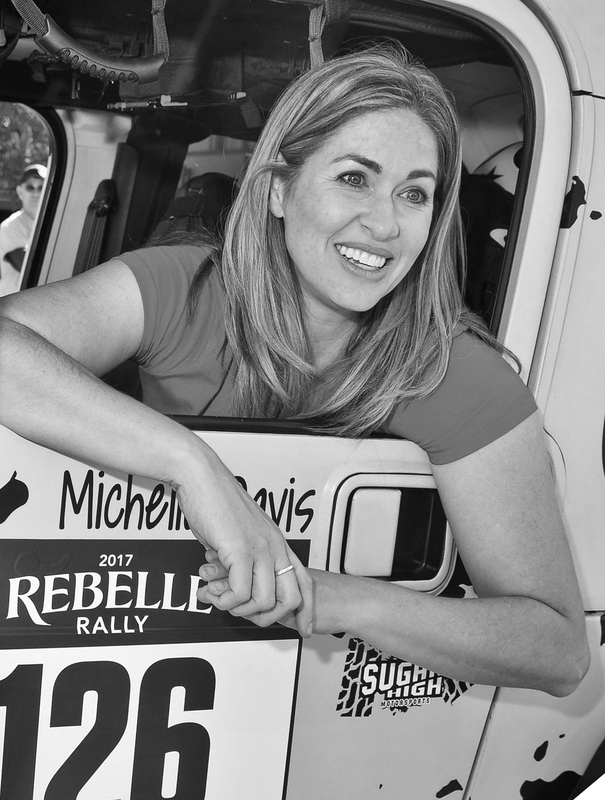 NOTE: Today my guest blogger is my 13-year-old daughter, Faith. She will be telling you about her gingerbread creation based on the movie/book The Polar Express. Her beautiful entry won second place in the teen division of our local gingerbread contest this year. She made me so proud. Enjoy! My gingerbread house this year was actually a gingerbread train, inspired by the movie The Polar Express. Above, you will see that the train consists of three main parts: an engine, the coal cart, and a passenger car. I will be explaining how I made the key points to each section of the train. 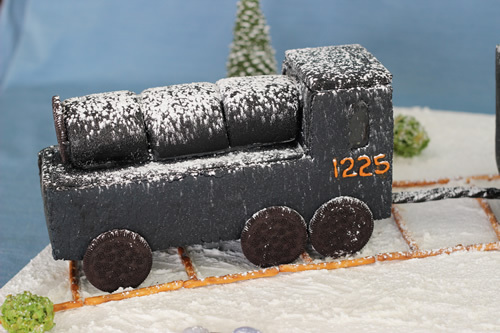 The basic structure of the train is from a pattern in the book, Gingerbread Art , that I enlarged and then resized accordingly. Since the top of the engine wasn’t included in the pattern but is key in making the Polar Express, I came up with a way to make it. First, I took out three Giant Roasters Campfire Marshmallows . Next, I had to make them black, so in a small glass I combined a little vodka and a little black food coloring; making a black paint. Using a clean paint brush, I coated each marshmallow about three fourths of the way, knowing the bottom wouldn’t be visible. With black icing, the marshmallows were attached individually and half an Oreo was put on the front to add a little more dimension. Personally, my favorite part of the train is the coal cart. There were two main parts that made it look so special. The first thing I did was the lettering. This step is easiest when done before the assembly but can be done at any point. 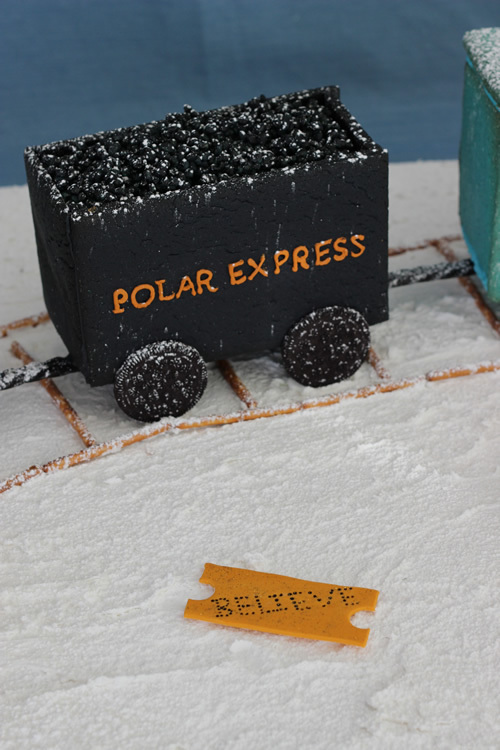 I found a picture of the words “Polar Express” and used a projector to get the correct placement on the gingerbread. 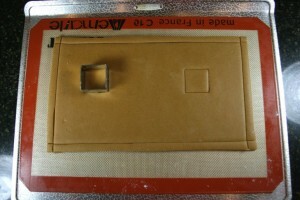 The next step was simple; all I had to do was trace the projection with gold icing. The most important part of the coal cart was, of course, the coal. Before I began to make the coal, I took more of those large marshmallows and filled the majority of the cart, leaving some room for the coal itself. For the coal, I used the candy, Nerds . Again, in order to make the Nerds look black, I had to use the vodka and food coloring method. This time, I had to be careful to only use a handful of Nerds at a time to ensure that they all got fully coated. Finally, I put them in the cart and arranged them nicely. The windows in the passenger car were made out of isomalt that we colored with yellow food coloring . If you don’t know, isomalt is extremely hot sugar that serves many different purposes. In our case, we heated up the isomalt in a glass measuring cup and carefully poured it into the window space we had left in the gingerbread. I had to let this cool and harden completely before attaching the window dividers. The dividers were made out of red fondant that I cut into strips with a pizza cutter. I made the mistake of laying the strips directly on the isomalt just to get an idea of where I wanted them, and they stuck. Luckily, I was able to get them off and start over, placing them were I wanted this time. I had to be very careful the second time to not let them touch the isomalt until they were in place. 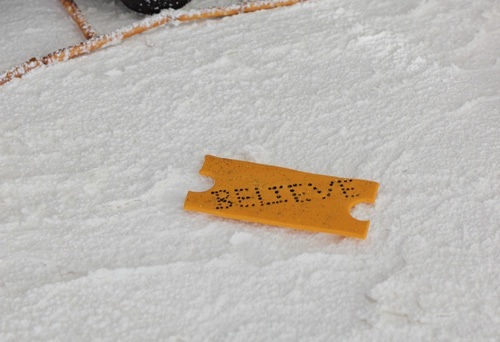 The center point of my gingerbread display was the signature BELIEVE ticket that was featured in the movie. The ticket was made out of gumpaste that I colored as closely as possible to the lettering on the train and engine. To get the distinct sides of the ticket, I used a small circular cutter and made the half circle cuts on each side. I wanted to make the letters look like they had been punched out, just like in the movie, in which case I had to turn back to black food coloring. I dabbed the end of a toothpick in the food coloring and put black dots in the shape of letters all around the ticket. It took a few tries to get it just the way I wanted. To add some flair to the ticket, I used gold disco dust . I brushed the dust all on top of the ticket with a small paintbrush until I was satisfied. The gold sparkle really catches your eye and gives it that extra something. 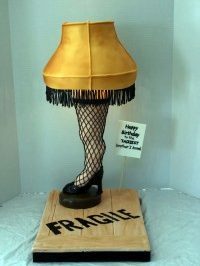 You’ve probably noticed that I used both black and blue gingerbread. 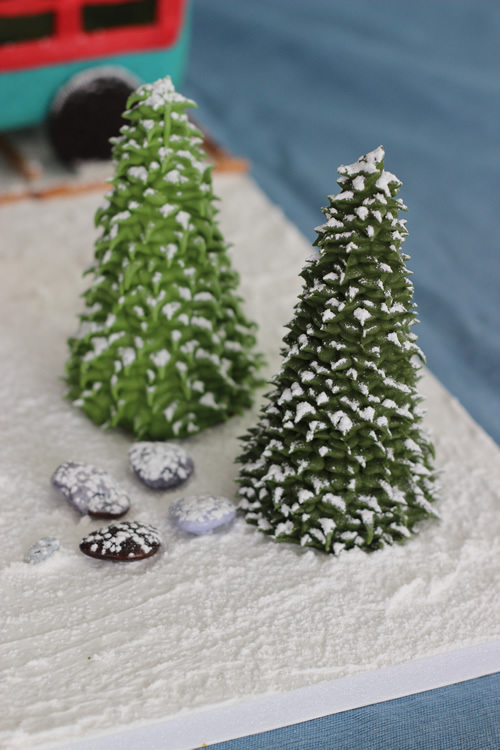 This was accomplished by kneading food coloring into regular, uncooked, gingerbread until we reached our desired colors. 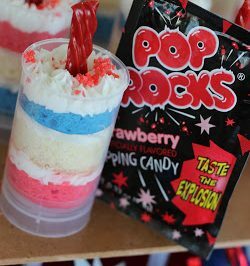 Using too much food coloring will cause it to be sticky and not turn out as well. I made this mistake with my first batch of black that was originally a dark blue from another house being made. The final touch was the “snow” that went all over the board. 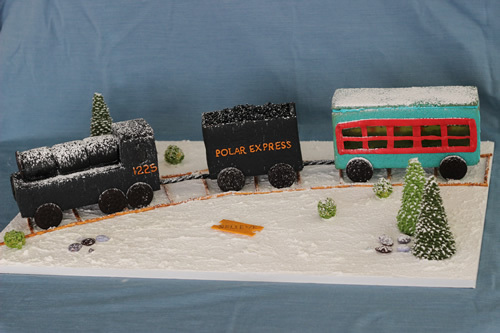 Before putting the train and tracks on the board, I spread white royal icing on top of it. This was just for a base. 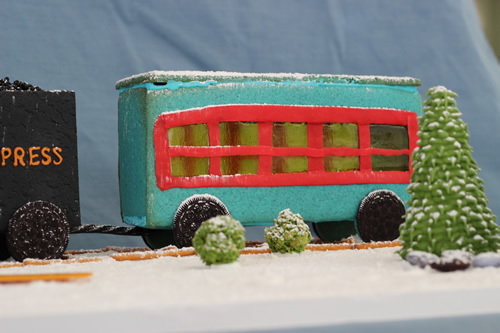 After adding the tracks (made of pretzels), the train, trees, and chocolate rocks ; I put the powered sugar/snow on top. When using powdered sugar it can get messy so I took it outside before starting. With a flour sifter , I gently coated the whole board with the sugar to make it look like a brand new snow fall. Thank you for reading and I hope you enjoyed the pictures!